Over the next couple of years I will be reporting here regarding how my experience with sMath compares to that of the products which it substitute for from my perspective as a 34 year old re-entry electrical engineering student. Presently, I'm familiar with Matlab (I will not be all caps-ing that products name), and just getting familiar with Mathcad Prime 4.0. Although for me, more lines of code I try end up working in Prime 4.0 and that is why I personally need it, because of the time it saves me... although my approach of banging my head against the wall of software by permutating my code instead of asking for help is probably why I wasn't as successful with sMath. The corporation is generally difficult to deal with in my experience. Contacting PTC four times regarding two simple questions was necessary before I felt comfortable paying them. My question was whether the $200 Electrical Engineering pack of 457 worksheets would work with the student edition and if I could get the current student edition, which is now 5.0 in a perpetual student license. They found all manner of dissuading me to pay them, from not forwarding emails, ignoring messages, absurdly useless chat sessions, to my local representative Mr. Julian Lockwood, who invariably misspelled my name, expertly furnished erroneous information regarding his product. It took them two months to get me answers and half of the information provided was downright false. For instance I asked if I could get this stupendously cheap 10 Euro perpetual license of Prime 4.0 in English and if Prime 5.0 was available? For that reason, and the proficiency of the participants, sMath's forum is fundamentally stronger than the PTC corporations because it is not contaminated by version conflicts. Additionally, people are amazingly eager to help on this forum which another one of the best things about sMath. My intended use for this type of software is as a CAS and expect to do things at least as easily as in Casio Classpad Manager but in a more sophisticated and capable manner. Prime is less user friendly but more reusable than Casio. At this point Classpad is still my gold standard for usability with respect to the few functions I need regularly... solve, systems of equations, and quick impromptu calculations. They even have this new thing which I have no experience with but the Company might be trying to scale it up into sMath type tool. I know of noone who uses it and Casio's support is wishy washy as well. Mr. Charlie Watson is the companies greatest resource beyond the classpad. Matlab details release notes concisely with expandalle section where more details are revelaed. Compatability considerations are even highlighted with an exclaimation mark. Maple provides less detail than Mathmatica but still a nice consice summary of chages. This is the same response I received when initially asking about their product. Their vendor who's contact information is specifically given wont even forward the information to the company itself. PTC is laughable and I Digital River is really accommodating their dysfunction... It's like PTC doesn't want to maintain it's market share in the first place I'm sure Digital River would rather deal with a company that is more concerned with it's sales than PTC is about Mathcad. after PTC acquisition [April 1 2006]. © 1986-2003 Mathsoft Engineering & Education, Inc. All rights reserved. Mathcad is a registered trademark and Mathsoft, MathConnex, QuickPlot, Live Symbolics, IntelliMath and the Collaboratory are trademarks of Mathsoft Engineering & Education, Inc. U.S. Patents 5,469,538; 5,526,475; 5,771,392; 5,844,555; and 6,275,866. International CorrectSpell software © 1993 Vantage Research. MKM (MathSoft Kernel Maple) © 1994 Waterloo Maple Software. Microsoft Internet Explorer © 1995-2003 Microsoft Corporation. File Filters © 1986-2002 Circle Systems, Inc. HTML Help © by Microsoft Corporation. Portions of the Mathcad Solver © 1990-2003 by Frontline Systems, Inc. PDEFIT © 1995-2003 Dr. Klaus Schittkowski. Microsoft, Windows, and the Internet Explorer logo are registered trademarks and Windows NT and JScript are trademarks of Microsoft Corporation. All other trademarks are the property of their respective owners. read any of the Mathcad/Mathsoft. Typical: my Web site 100 MB work sheets 11.2a is dead too. MCD 11.2a and earlier subscript same as Smath. In short PTC Mathcad does not read Mathcad/Mathsoft [an illuminati gun shot in the head]. 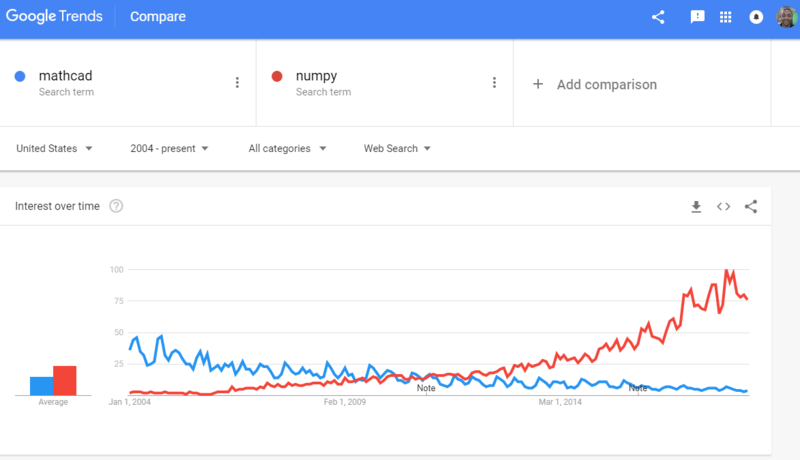 I think that you are right about the trend. But I don't think I'm wrong about PTC. 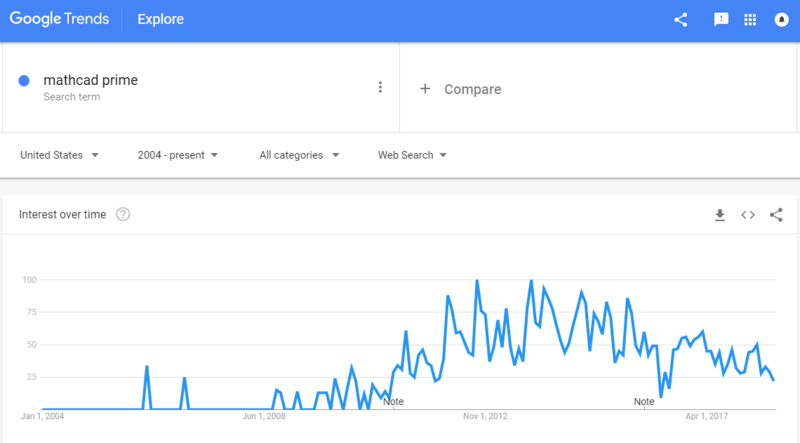 Even Google trending "Mathcad Prime" still reflects the company is driving the software into a decline over the past five years. Some of the legacy file content will run in Prime. There is a button in prime called "XMCD, MCD converter" which lets you try and convert files over. It worked for a simple solve block I made earlier but I do read online that people complaining that it is not comprehensive enough. I'm not sure what the motivation was for PTC to try and reinvent the wheel with Prime ,but whatever it was, it seems to be a bygone impetus. "This mailbox is no longer being monitored"... What? How hard is it forward customer emails? I'd image perhaps as easy as it is to configure an automated reply. Declining interest, end of the road map, licensing complacency, damn near giving the product away (10 Euro for a perpetual student license), non-nonsensical sales representatives. What else can PTC do to tank another product. It will be exciting to see... I imagine that the inside of PTC's corporate headquarters is a circus or carnival like. Somewhere I read that their install base is 250,000. I don't anticipate being one after college because I feel insecure with the strictly subscription model. It seems like companies can brick more and more stuff now a days remotely, your Tesla, iphone, headphones (nuraphones), and all manner of other things increasingly. My engineering tools should not be one of those things... especially, especially not under PTC's oversight! I am sorry, but after reading your recent lengthy posts I really do not see what was your point. You described your inconvenience with PTC and licensing procedures, put some stress on PTC' customer support and its general activities. Why did you do that regarding this thorough analysis? Why then did PTC get $316.62 and sMath $10? Why did Mathworks get $100 for one year of Matlab and Simulink student license? Why will Mathmatica get $155 and Maple get $100 for their student licenses? For me, point number one on that list of attributes would be worry free, no hassle, simple, perpetual licensing with complementary updates... In this way sMath is superior to it's competitors. For instance, I have a Matlab subscription student license I use for my classes because that is what the Accreditation Board for Engineering and Technology (ABET) dictates undergraduates must know. And even though my license is good for one computer it was exceedingly cumbersome to license the install on both the Microsoft Windows and Fedora Linux partitions of my Fujitsu T726 laptop. After repeated attempts, under the guidance of support emails I gave up on it. So even though perpetual licenses are available for Matlab the process of activating a dual boot was godawful. I am substituting in Prime for sMath and not the other way around. I first tried to incorporate sMath into my workflow for 6 months with mixed results. So mixed I'm trying something else. Smath is not a clone of any other CAS. Start by refreshing the two Smath documents I have doctored. What do you think Smath has to do with Prime ? A good way to explore/appreciate Smath, download all "Samples"
That will keep you busy for a while, while steeping your learning curve. SageMath is far from being the gear of the Century. Just to make some additional comments...As you could see regarding this Forum, lots of us here (especially the long time users) would have liked that SMath would have been better. Unfortunately, SMath has its flaws (in spite of so many years of its development) that we still do not like. How long would this take in order to make it much better, nobody knows. To make long story short - the fact is that you could simply try it without any consideration about paying, licensing etc. I think that nobody can answer the question what would happen if there could appear a significant financial investment in SMath. However, If you find it suitable you can just use it and try to contribute in some way. Otherwise, you could stop using it and try something else. I think we did not say anything new here regarding free and non-free software, and we just have to accept the way it is. 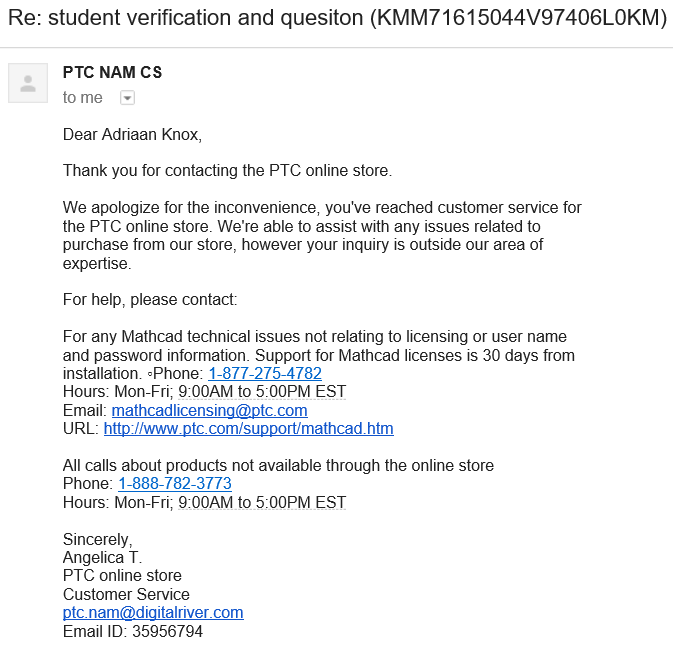 ...PTC Mathcad can't read any of the Mathcad/Mathsoft. Typical: my Web site 100 MB work sheets 11.2a is dead too. Thanks, interesting to see by how much PTC freaked Mathcad/Mathsoft. Their double line program is the horror of the Century ... one line for each eye ? Looking back at my Smath files, I downloaded 61 examples, many of which were way over my head mathematically, programatically and scientifically. As I continue to use PTC Mathcad Prime I am helped greatly by a almost 600 page textbook entitled "PTC Mathcad Prime 3.0". I'm sure SageMath is at least equally as rich in it's capability count and I myself would personally benefit from such a publication on the software. Is this the most comprehensive book on Smath? Thanks for sharing. I'll be sure to check this out. Do note there are some other resources. Martin Kraska publishes a German Language PDF Handbuch. This was last updated in October this year. Additionally, he also publishes an interactive handbook in English that I find very useful. If not already installed in your SMath Studio, you can install by clicking on Tools -> Plugins-> Interactive Books-> Local Storage -> Online Gallery and choosing Interactive SMath Handbook. This has many already completed examples. I couldn't open the PDF "Trajectory". For those interested Cannonball is a pretty good lecture. Maths Cannonball.sm (30kb) downloaded 33 time(s). I'm trying to find a software that will let me evaluate what I guess it thinks is an over-determined matrix. It seems most software interpret simultaneous equations as a matrix and they want the system to be square with an equal numbers of unknowns and equations. Please look at page 2 of this document where I am able to perform a calculation with limited success on my Casio on the top half of the page where it is not doing all of the substitution for whatever reason. That is the calculation I would prefer to do. overdetermined simultaneous equations.sm (337kb) downloaded 12 time(s). After a simple numerical substitution, we solve a system of three linear equations. Primer.sm (15kb) downloaded 25 time(s).